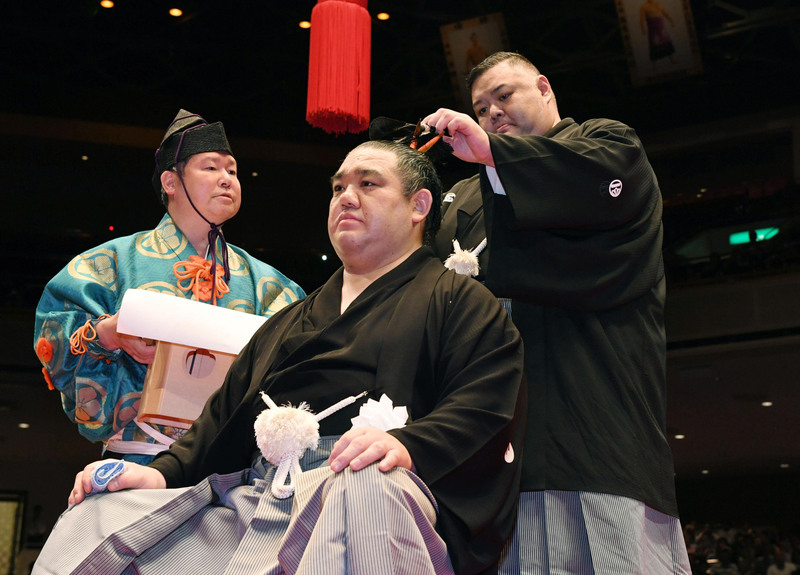 Now that Kisenosato has retired, one of the first orders of business for him will be arranging a retirement ceremony. Virtually all wrestlers end their career with a dampatsu-shiki (hair-cutting ceremony) but for lower-ranked wrestlers it’s normally just part of their stable’s regular end-of-tournament party. 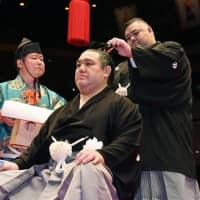 For high-ranking or famous rikishi, however, so many people want to be involved and bid farewell that it necessitates the hiring of hotel function rooms or even Ryogoku Kokugikan itself. Kisenosato certainly falls into the latter category and so it will take several months, or perhaps even a year before the event is ready to go ahead. The central part of a retirement ceremony is the cutting of the hair. One by one, several hundred people will step up onto the ring behind a seated rikishi and cut a single strand of his hair with gold-plated scissors. The final cut, which removes the topknot completely, is made by the stablemaster. Once they have bowed to everyone present, the wrestler in question heads backstage for his first trim and style by a regular barber in years. Prior to the hair cutting there are normally other activities, many similar to what can be seen at a regional tour event. Sumo with kids, rikishi singing, demonstrations of topknot styling, etc., are often on the schedule. A sit-down interview on the dohyo with the retiring wrestler is an occasional sight as well. While the Japan Sumo Association allows the use of Ryogoku Kokugikan, dampatsu-shiki are private functions with all proceeds from the day going to the man whose career is about to end. A special committee, set up for the ceremony, normally sells tickets for the event. There are also original one-off mementos and souvenirs sold only on the day of the ceremony.